Want to learn how to brew loose leaf tea? I used to know very little about brewing loose leaf tea until roughly a year ago. I use an electronic tea maker, but there are other methods as well. Depending on your budget, there are a number of different ways on how to brew loose leaf tea. This article discusses 4 popular methods. Many online tea shops sell pitchers or pots that come with a built in infuser basket, or you can buy a separate infuser. ii. 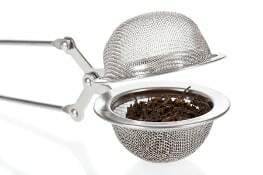 Enclose your tea leaves in the infuser, and then place the infuser inside the pitcher or cup. Make sure to not fill the infuser too much because you need the leaves to expand. iii. Warm up water in a kettle to the recommended temperature for your specific tea. This step may require you to purchase additional devices to reach the correct temperature. iv. Add the hot water from the kettle over the infuser and into the pitcher or cup. v. Let the infuser steep inside the water for the correct amount of time. vi. Remove the infuser from the water. vii. Enjoy the brewed tea in a tea cup. This method is similar to using a strainer (see above), except you filter the tea leaves after the tea has been brewed. The tea leaves are placed directly in the water to fully expand during brewing and then the water is filtered after steeping. Take a look at the Perfect TeaMaker by Teavana or IngenuiTEA teapot by Adagio Teas. Tetsubin Cast Iron Teapots from Japan are said to be the best way to extract the full flavor from loose leaf tea by distributing heat evenly during the brew. There are two types, but I will only be discussing the kind that is not meant to be placed on the stove. i. Heat up water in a separate tea kettle to the appropriate temperature for your tea. ii. Preheat the cast iron tea pot by putting hot water inside and then drain. This step is meant to make sure that the water temperature does not drop later on. iii. Put your loose leaf tea in the infuser that is part of the cast iron tea pot. iv. Fill the cast iron tea pot with the hot water from the kettle and wait for the appropriate steeping time. v. Pour the tea into a teacup and enjoy! These tea makers make it simple to brew tea with built in electronic thermometers and time settings, filter baskets, and tea jugs. I use the Breville Tea Maker on a daily basis. If you are looking for an easy way how to brew loose leaf tea, this is probably the best method. For a very general overview of the process: you fill the tea maker jug with water, place the correct amount of leaves in an infuser, select the proper brewing time and temperature, and select start as the tea maker handles the rest. Many tea experts disagree on the best way on how to brew loose leaf tea, but hopefully this article gave you a good overview of 4 common methods.